The Binderie Punch + a Giveaway! So here it is, my first review. Let me say how super excited I am to be a part of this amazing team! WOO HOO! About a year ago, I became really interested in making my own albums. Not just the pages inside, but the covers and everything that goes in between. I bought the Bind It All and enjoy that. You can find a review on that item here . There is a product that 7 Gypsies has out called the Binderie Punch tool. It is an electric punch that drills holes for easy binding with binder rings. I had heard about this from a friend and I really wanted to try it. Well come with me and I will show you what I have found. Straight out of the box it seems compact, lightweight and pretty much portable anywhere. 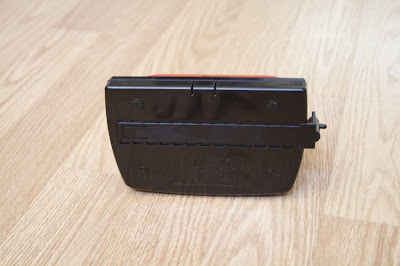 You can either plug it in (you have to purchase a cord for this as it is not included) or use 6 AA batteries. At the bottom of the unit is a notch to push in and the bottom comes off. This is where you put your batteries. It is also the place where the discarded punch outs fall and you will need to empty this periodically. So I put in my batteries, got a piece of cardstock and put it in, pushed the button and voila. Piece of cake. Then I tried chipboard. Easy Peasy. Next came the real test: A wooden door hanger. Dum....Dum...Dummmmm (imagine the music here). I managed to get the piece in the tool, it took some wiggling, but I got it in. The result: LIKE BUTTAH BABY! I kid you not, this thing punched that hanger like it was walk in the park! Please note that the hanger was too thick and not recommended for this punch. Anything less than 1/8 of an inch should be good. It has a handy little ruler to measure on the bottom to space out your holes evenly. It also has a little notch that will allow you to drill holes evenly on a 12” sheet of paper. This machine drills two holes at once, so you simply put your first hole over the notch and pull out until the arm clicks. Once it clicks you press the button to drill your holes. You repeat that step until you have the desired amount of holes on your project. Very handy for sure! What I made: Here are the projects I made with it. Overall I think it is a great product and a quick and easy way to bind a book or any project. So how does it differ from the Crop-A-Dile? No measuring or uneven holes, since you don't have to eyeball anything. Your punched holes will always be perfectly spaced and in line. It is also electronic, so there is no muscle required. 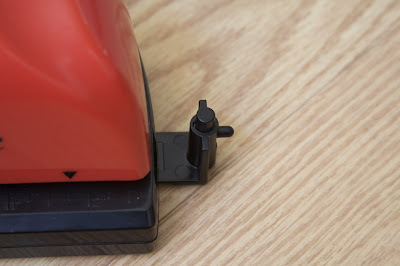 Once you load your items in to the slot and hit the button it will cut through anything with ease and without any elbow-grease on your part. Based on these features some will likely prefer the Crop-A-Dile while others will gravitate the Binderie...it's really up to you and your specific crafting needs. - Super easy to use. - Doesn’t come with an adapter cord. - Isn’t really clear on how to load the batteries. - It is not a very versatile machine. It does do it's assigned job very well, but that is all it does. Depending on your specific needs this may or may not suit you. Ease of use: Extremely easy! I am of no help... i don't have a Binderie or a Crop-O-Dile, but I loved your review. Honestly, I would probably go with the COD because I can purchase it locally with a coupon and it would be cheaper. Thanks for another great review! The Binderie sounds interesting. I really appreciated your review and I had not previously heard of this product. I doubt if I would run out to buy this. I think that without a power cord it would be bothersome to use. (I hate having to deal with batteries.) I do currently own the Crop-a-dile. Thanks again for the review Ashley. I'll look forward to future reviews from you! I have the cropodile and love it but I do hate eyeballing it. This would be very cool to try. Lisa L.
haven't used the Bideria but I love my crop-a-dile love how easy it is to cut through things. I confess I've got mixed feelings about the Binderie. On the one hand, it does its job very well. But, as you said, that's ALL it does. I think it's one of those things that, if I was given one as a gift, I'd be pleased and probably find myself using it from time to time. But would I go out and buy one? Probably not. I've already got the BIA and find it meets my binding needs quite well. Thanks for the excellent review, and for the chance to win some goodies! I honestly don't have either tool, but I've had the crop-a-dile big bite on my wish list for some time now. I have not tried it, but now after the review I just might. I'm not big on products that only do one thing. I tend to not buy them. I really love my crop-a-dile because it punches a lot and is very portable. I don't have trouble "eyeballing" where the holes go, because I measure and make marks before I punch. I love 7 Gypsies! Would love to win a fabulous package from them. Hi..really found the review interesting !! I dont have a Binderie or a Crop O Dile..but hopefully in the future might own either & will definietly come back here to check the reviews for easier decision making !! Haven't tried the Binderie, but would love to now after that great review...thanks for telling us all about it!! I haven't tried it but have been interested to see how it works. I already have the crop a dial so will probably stick with that. It looks like it works for what it's suppose to but also seems very limited in it's "job ability" (I guess that's why it's good at what it does it only has one job to do...Lol) the limited other will probably prevent me from getting it though. awesome review and adorable projects ashley! so glad you're part of our team! I hadn't heard of this before. Great review. Looks like it would be easy to use and give you straight line of holes, that would be a great thing. Stinks that it doesn't come with a power cord, I hate using batteries, lol. I hadn't heard of this tool; thanks for the great review and the chance to win some goodies! I never heard of this tool before. It looks interesting. Thanks for the review and the chance to win a great prize. love this review and the product seems super easy to use. i love that i wouldn't have to use a single muscle trying to punch things - i sometimes need my hubby to punch through heavy duty projects with the crop o dile. adding to my wish list - thanks! I don't own a Binderie but I have used one! I have to agree with you in that it does the job that is intended, however I would love to see an adapter cord as well. This would be great for many projects but I would wished that the gap was a little bigger to fit more thicker mediums such as a heavy chipboard. Over all, it is a wonderful tool. Your product review was awsome!And yes I could hear the music LOL. In closing, I would buy it just to have it in case I was pushing out several mini albums or other multiple projects at one time! I have the Bind it All and will probably stay with it and mr Cropodile. I think it u=is too specialized for me to buy. I have never heard of that. Very cool product! Thanks for reviewing it for us!!! 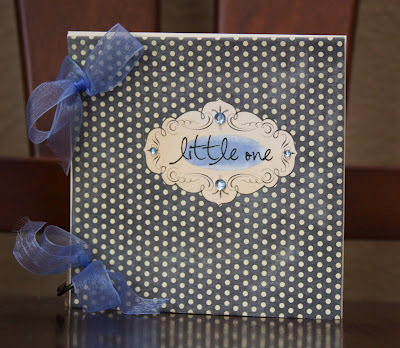 Coincidentally, I've been looking at various tools to get started on making mini albums. The Binderie is one of those I've been looking at (BIA and C-A-D being the others). I agree that a power adapter should have been included. Still on the fence about this but greatly appreciate your review! I haven't tried the Binderie, personally, but we are very happy with our trusty Cropadile at the moment. Thanks for reviewing the product - it actually helped me to make my mind up that I probably won't get it right now! I haven't tried this but would like to. I've got a Cropadile and love it, but the ease of use of the Binderie would be good to have. Might be nice if the adapter cord was included. Thanks for the review. It sounds like a good product but one that I can hold off on purchasing for awhile. Looks very very interesting. Might just have to have it. Thanks. Thanks for the great review Ashley. I love the idea of being able to create the whole mini album yourself, cover and binding included! Great review! I have never heard of this product! I am really getting into mini albums so it really appeals to me! I would definitely use it over a Crop-o-dile! Honestly, I think I'll probably stick with my crop-o-dile. It is a little spendy for a one-trick tool. Never used the Binderie, but I have a COD and LOVE it. Adore 7Gypsies stuff, but probably would pass on this item since the COD suites all my punching needs. Thanks for a great review! I have the crop-a dile and love it except for the having to eyeball everything. I will definitely have to try this. thanks for the reveiw...I've looked at that thing so many times and was never sure what it did. something for the wishlist. Interesting... but am still tempted more by the BIA. But thanks for the good info! This is certainly less expensive, although I haven't been too traumatized by measuring and using my cropadile for binder rings. The Binderie looks really interesting and I've been looking for it for a few days now. So thanks for the review. I believe its available now but I tried to find it on Two Peas and only found others trying to find it themselves. I don't really think this compares to the cropadile, that's a totally different animal. I can see why you wouldn't want to compare it to the BIA directly (you probably were told not to) but for the price I like this better. Great review! I have been looking at this and the Bind-it-all b/c I don't have either one. So many good uses for them. I do have a crop-a-dile and love it, too - but with this lining it up for you, hmmm... looks really nice! I only know the crop a dile... love to have this one !!! Hmmm... looks intriguing. I may use it over the Crop-o-dile, but not entirely sure. I would love to try one out! I enjoyed reading your first review. I think I just may have to try it. Nice review! I have actually never heard of this before, so it was nice getting a review on a "new" product. I have the crop-o-dile but since my wrists are bad it would be nice to have an electric hole puncher! i'm not really much of a gadget girl, i spend all of my money on patterned paper, so there's never any left over to purchase tools! since i already own the cropadile (it was a gift! ), i will not likely purchase this product... although I do l♥ve•l♥ve•l♥ve 7gypsies!!! I would love one of those since I will pretty much make a mini album out of anything I find that I can adhere paper to!! I have never heard of this machine but it sounds awesome for use in making your own books and binders!!! Thanks for the review. I have not heard of this before now so I will have to check this out since I don't have any type of binding machine. I like it, but I have both a CAD and a BIA, so I'm not sure where it would fit in between those. It does seem really easy to pack, though, so that is a for sure plus! That was a really good review & now I want to buy it,LOL! I have used the crop-o-dile but haven't bought my own - and now I'm glad 'cos I would prefer this. But the crop-o-dile big bite can get deep into things which I don't think this one can - so one really needs all the tools if you can afford them all! I am starting to feel like a carpenter with all the tools I'm schlepping to and from crops (and I'm not knocking carpenters- my husband is an awesome one! )- so I don't know that I would want to buy one, I'm still loving the Big Bite. This sounds awesome! I would love to make my own albums, but I need directions. I don't know what supplies to use or how to get started. I love how this makes perfectly alligned holes. Am I brave enough to try? hmmm? I like reading your reviews. It comes in helpful when trying to decide how to spend my limited scrapbooking dollars. I'm not a fan of the Crop-a-Dile, so this sounds like it would be a good fit for me. Just what I've been looking for--thanks! Maybe I'm living in the dark ages, but I've never heard of this before. I think it sounds great. I like that you can line up your punches and measure an even distance. I'm terrible eyeballing it...which has prevented my from getting the crop a dile! I have not heard of this tool before and I consider myself a tool junkie! I'm not seeing the benefit of it over my crop-a-dile yet, but would love to hear what some of the readers think! I don't have a Binderie - but I have a Crop-A-Dile. Your review of this product was great. I wouldn't have thought of purchasing one before - thinking the Crop-A-Dile does all I need, but the idea of not having to measure to get perfectly spaced holes - and that no elbow grease is required will make me do a double take. Thanks for a great review! I finally got to use a Crop-a-dile a couple of months ago - love the ease of using it, but didn't like that holes were off. The Binderie is limited. Thank you for the comparison! I have not had the chance to use either tool. After seeing your mini album, I would love to have the Binderie punch to make little albums for my parents and grandparents of my kids (2 1/2 and 5 months). I also envision making albums for friends moving away, parties, fun outings, family trips, etc. What I like about it (based on your review) is that it will make even holes, and does not take muscle power! Great review!!! This sounds like a really great tool, adding it to my wish list! Well I haven't used the Crop-a-dile or the Binderie but definately feel informed. Ashley your review was awesome, you are doing a great job. I have a BIA and Cropadile already and don't see a need for me to buy the Binderie but was very interested in reading the review. Thanks! I think I would still use the Crop-a-dile because its so small and portable I can carry it in my scrap basket but the Binderie punch looks like a good tool to have on the desk at home for other bigger projects. I don't have the Binderie or the Dind it Al or the Cropodile. I have used the Cropodile and don't like eyeballing things, also I have artritis and it can be difficult for me to use. I saw the Binderie at the craft store, but was in a hurry and didn't have time to ask about it...wish I had, this might just be for me. Thanks for the Great Review!! I've never tried the Binderie, but I do have a Crop-O-Dile, which I LOVE! Best thing ever, but I wouldn't mind trying the Binderie out, if anything because I love 7Gypsies! I do have a crop-o-dile and use it a lot but I do have trouble with matching holes. I might like to try the Binderie in the future. i sue my crop-o-dile all the time -- would love to try out the binderie. thanks for the chance at the prize pack! Love my cropodile, but have been wanting to try this punch because I make so many mini albums. Thanks for your review! I have it, haven't used it yet but I wanted to add a little hint I found. I had an extra wireless router laying around and the cord worked perfectly with it. So check old equipment you have laying around to find a cord for it. I'm glad I read this article. 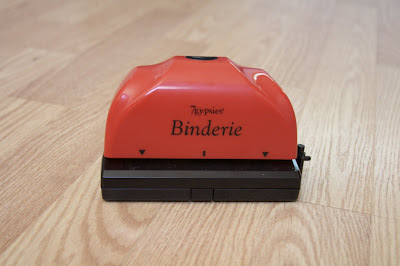 I thought the Binderie was similar to the Bind-It-All. I will keep using my Crop-A-Dile for now. Great review! I don't think I would by the Binderie when I already have the Cropodile, but if I didn't have one, I would definitely consider it. I have the Crop-a-dile and the Bind-it-all and love them both. But, I may have to try out this lovely little gadget too! LOL! I usually want everything I see and this is no exception. I can think of tons of uses for it. Thanks for the review - the stuff you made is so cute! And happy birthday to Shelly! Thank you for the review and for a chance at the giveaway! 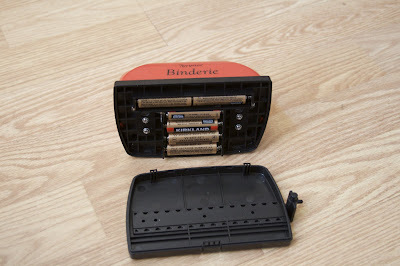 Thanks so much for reviewing the Binderie - I had seen it before but was unsure if it was supposed to be like the Bind-it-all or if it was just a punch. Now I know! It looks interesting, but I think I'll stick to my cropadile as I don't do many mini books. I hate having to eyeball stuff, this would definitely be much better than using the crop-a-dile. Gosh I must've been under a rock, because I didn't know about this product from 7 Gypsies. Thank you for your review, it was very helpful and I may have to check this project out. I have a cropadile and I love it. But looking at the binderie, I may want to try something new. My only issue is that I am always buying stuff like this that I never use. I would hate to buy it and put it in that pile. I have to think about it some more. 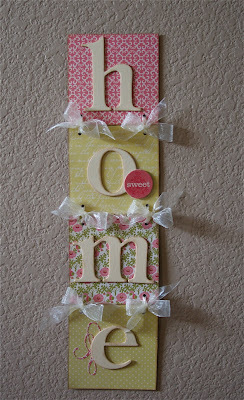 Maybe one of my scrap buddies will buy it for me try. I have the Crop-a-dile already so I probably wouldn't cough up the $40 to purchase this real quickly ... maybe if my LSS offered another super saver type of program or I can pick it up using a 40-50% off coupon I'll check it out, tho. Thanx for the review and blog candy opp! Awesome review. I've not used either product but I like the idea of the Binderie simply because I hate eyeballing and I am most definitely NOT a measurer (! ), plus I'm huge on rechargable batteries so no powercord is fab for me - we don't have many power outlets in our super old home, so it would be great. Loved your examples - very cute. I have not tried this tool. It looks interesting. I would be willing to try it, but not sure if I would buy it without trying it. Thanks for sharing with us. I never would have bothered with this tool if you hadn't told us about it. I have to admit I had no idea what this was until I read your review. I think I'm good with my crop-a-dile for now, but maybe now that I know it's out there I'll recognize when I could use it! This looks to be very portable and could go along to scrap weekends and workshops. I have arthritis so this is very appealing. The Crop a dile makes my hands hurt if I have to do too many. The only reason I don't like it is because I don't like binding albums with rings or ribbon. They're too flimsy, and I am klutzy and might hurt them. For other projects, like the hanging sign, it's not too big a deal to use my cropadile. I defintely prefer my bind-it-all. I have not tried the Binderie yet, but I would! I think I would use it over the Cropadile. Thanks for the info! I haven't even seen this tool. Don't know that I'd want to pay full price for it but if there was a store coupon, maybe...maybe not. I am just not liking that price. I have my Crop-A-Dile which does a great job of punching thru acrylic and chipboard so I'm happy with that for now. I have just gotten used to marking where I need to punch holes so they are pretty straight...a bit more time consuming but not much and this gives me fairly evenly lined up holes. Ashlee, great job for your first time.You will be a great asset to the team. I have been looking at the crop a dile and BIA but have not brought because of pain and weakness in my hands. This would be something I am very interested in. Thanks for the great review and the chance to win. I love 7 Gypsies products and I've heard of this and was excited to see a review on it! I love my Crop-a-dile and Big Bite and I think I would stick with those. Battery free for me! I don't know if I'd use this tool. I have both COD's and the BIA. I don't use these 3 tools on a regular basis, only when needed on certain projects. And with my space getting smaller everyday, I really don't have the room. I do like the idea that it runs on batteries though. I have a cropadile and really it so would continue using it. I love to read reviews on new products. Thanks for the fabulous review of the Binderie, It sounds like the ticket needed for those days where my hands are two weak to squeeze my crop-o-dile.